Here you'll find everything you need for travel, such as currency exchange, Wi-Fi & internet access information, spa services and much more. All of MIA relief areas are equipped with dual surfaces and waste disposal stations. Passengers have access to a full service Bank of America branch located on the 4th level of North Terminal D.
Two multimedia-ready auditoriums are located on the 4th level of North Terminal D and 3rd level of South Terminal J. It can be reserved for special functions and meetings. For additional information and reservations, call 305-871-4100 ext. 2238. Open daily from 5 a.m. – 9 p.m.
With proper identification (e.g., driver's license, birth certificate, passport), affidavits can be obtained for $10 at the baggage checkroom. Other services, including notary services and baggage accessories, are also available. For more information, call 305-869-1163. Baggage wrapping service is available at stations throughout the 2nd level of the terminal, pre-security. This service allows passengers to protect checked luggage prior to check in. The wrap is nontoxic, 100% recyclable, tamper resistant/evident plastic film. Please note that only luggage wrapped with the on-site vendor can be rewrapped at no cost, by the vendor. Offsite wrapped luggage will not be rewrapped. For passengers' convenience and need, MIA provides a non-denominational chapel room located on the 1st level of Terminal D between International Arrivals and Carousel 22. Catholic Mass is available every Saturday at 7 p.m.
Foreign Currency Exchange Booths are located throughout Miami International Airport. (1) location in the E Satellite building, open daily from 5:30 a.m. - 11 p.m.
Offering a wide variety of food and dining choices ranging from snacks and fast food, to fine dining, such as at MIA Hotel's Top of the Port restaurant, which offers panoramic views and is a great spot to enjoy breakfast, lunch or dinner. Learn more about MIA's restaurants and shops. 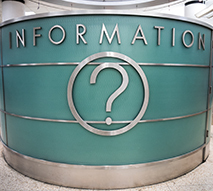 If you need language assistance, please visit one of the information counters located throughout the terminal. The Lost & Found facility is located on the 4th level of North Terminal D, next to Bank of America. Open daily from 8 a.m. - 6 p.m. Flying is something we take for granted. We hop on and off airplanes and within hours, we are able to see the world. Yet for individuals with cognitive or developmental disabilities like autism, traveling can be stressful and anxiety-producing. The crowds, noise and unfamiliar surroundings can be overwhelming. MIAair is a dress rehearsal program that allows passengers with different disabilities the opportunity to practice the travel experience in a safe and controlled environment. 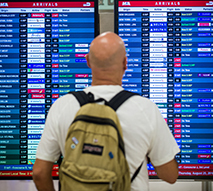 The program helps prepare travelers for future flights. Click to learn more. 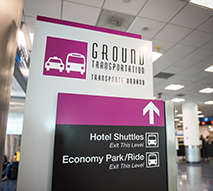 The new and improved mobile app for Miami International Airport integrates state-of-the-art, location-based technology with more than 500 data beacons installed throughout MIA to provide a personalized travel experience. Version 2 allows users to scan their boarding pass for the latest flight info and updates, navigate the airport with blue-dot technology, and find the closest shopping and dining, including walk times, based on their customizable personal profile. The Miami International Airport Hotel, located on the 2nd level of Central Terminal E offers travelers the convenience of an airport location, the luxury of 260 soundproof rooms and the Viena restaurant for fine dining. The hotel also offers well-appointed conference / board rooms and meeting facilities. For more hotel information, call (305) 871-4100, or visit www.MiaHotel.com. 3rd level between Dolphin and Flamingo garages. The MIA Mover is an elevated people mover system that connects passengers from MIA to the Miami Rental Car Center (RCC) and the Miami Intermodal Center (MIC). The MIA Mover station is located on the 3rd level between Dolphin and Flamingo garages. Use the 3rd level Skyride (moving walkways) to connect between terminals and train station. The Military Hospitality Lounge is run by volunteers daily from 9 a.m. - 9 p.m. Amenities include snacks, TV, computers, WiFi, and Skype. Military ID and evidence of travel required for entry. Located on the 2nd level of Concourse E, Temporary access through Concourse D (in the North Terminal), level 2. Nursing mothers are welcome anywhere at MIA. For moms looking for a quiet private option, look for the MIAmamas suites. The units are located on each of MIA's concourses, post-security. For more information, please click here. For multi-language assistance or to request a page, simply pick up any of the white courtesy phones located throughout the terminals. Paging service is available 24 hours a day, 7 days a week. Messages can be viewed on monitors located behind the ticket counters. MIA offers pet relief areas. The relief areas are enclosed units, which include synthetic grass, a fire hydrant, disposable bags, and sinks. Located post-security in Concourse D, F, G and J. In addition, outdoor areas are available at arrival level in Concourse D, E, and J. Plane Fun is a unique, interactive children's area. Located Concourse E, near Gate E5 and accessible from Concourse D as well. The RCC is located at 3900 NW 25th Street, Miami, FL 33142, just one mile east of MIA. Use the MIA Mover to connect between the airport and the RCC. The MIA Mover Station is located on the 3rd level, between Dolphin and Flamingo garages. As an option to skycaps, passengers may rent self-service luggage carts for $5 per cart. 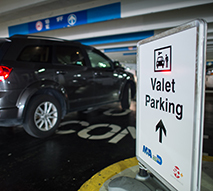 Self-service carts are available throughout the terminals, in the parking garages and inside the Federal Inspection Services enclosures. MIA's terminal is home to a wide array of award-winning shops offering innovative shopping experiences and an assortment of merchandise ranging from magazines to luxury leather goods and the latest fashion apparel. The 3rd level Skyride moving walkways connect all three MIA terminals - South, Central and North - with the parking garages and the MIA Mover Station to the Rental Car Center. 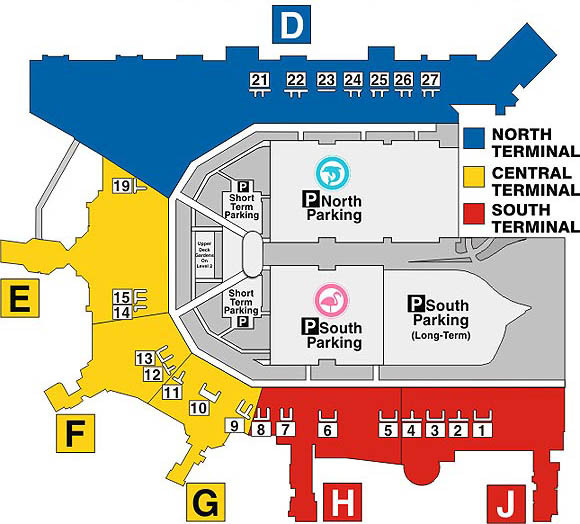 Smoking areas are located outside the terminals on Level 1 (arrivals) and Level 2 (departures) across the street from Concourses D, E, F, H and J, and inside Concourse D at the TGI Friday’s smoking lounge near Gate D-36. MIA's Jetsetter Spa is located on the 2nd level of South Terminal H. Services include manicures, pedicures, massages, and spray tanning. You can also receive a 10 minute express manicure on the 2nd level of South Terminal J, also offering pedicures and massages. If you have 3 - 5 hours between flights, we have some things you can do to occupy your time. Check with the Information Center located on the 2nd level of Central Terminal E. For more details, please visit the Things to Do page. Tourist Information Counters are located throughout the terminals, including the main counter on the 2nd level of Central Terminal E, near the airport's hotel. The counter is open daily from 6 a.m. - 10 p.m. For additional information, please call 305-876-7000. Translation Language Line is used by staff to access a translator for patrons whose language is not among those spoken by our multilingual staff. In addition to staffing MIA's Information Counters, our multilingual staff provides interpreting and translating service throughout all public areas of the terminal and in the Federal Inspection facilities. MIA has various airline-operated VIP Clubs and Lounges. 2nd level of the terminal. U.S. Mail Drop Boxes are located throughout the 2nd level of the terminal pre-security. The Wall of Honor memorial is a 51-foot-long, three-sided monument covered in black granite, listing the names of 119 South Florida military men and women who gave their lives during the global war of terrorism since September 11, 2001. The center wall of the monument located in MIA’s Concourse D on the departures level, the names of the fallen heroes are inscribed into the stone. Courtesy wheelchair service is offered through the air carriers upon request. To make sure a wheelchair is available at the proper time, it is best to reserve one in advance of your flight departure or arrival by contacting your airline. Wheelchair assistance may also be requested at airline ticket counters. Internet access on MIA's network is complimentary with advertising. The Yoga Room is a tranquil space devoted to practicing yoga.